JUST as they have delighted us on previous occasions, Valentine’s Day, Mother’s Day and Easter, Cuckoo’s Bakery have baked up a box of masculine sweet treats for Father’s Day. Show dad you love and appreciate him by presenting him with a box of six cupcakes which are just like him, manly on the outside with a soft centre! 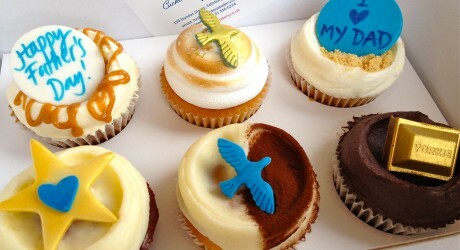 The six cupcakes are decorated with blue and gold, and feature edible plaques reading, ‘I Heart My Dad’ and ‘Happy Father’s Day’. The gift box will be available on Saturday 16th and Sunday 17th June. Cuckoo’s Bakery is at 150 Dundas Street, and are open every day except Mondays.